Casey had no problems with carboplatin. Doxorubicin/Adriamycin was a different story for Jet. Even administering the Doxorubicin is a much bigger ordeal, and it’s rare with dogs because they receive far fewer doses, but certainly people experience coronary side effects with doxo. Onco vet wants to do another chemo round with carboplatin or doxorubicin. He perfers doxorubicin because it’s stronger. Simon did very well on carboplatin. No side effects. The choice will be mine. I need to weigh the cost benefits of knowing carboplatin caused no side effects vs the increased strength of doxorubicin with potential for increased side effects. I consider this regimen with “do no harm “ in mind. Any thoughts on the increased strength of doxorubicin and increased side effects vs carboplatin, a bit weaker but more tolerable with no shown side effects noted? FWIW, I’ve never heard before that Doxorubicin is stronger than Carboplatin. I also saw that there’s a PEGylated Doxorubicin available now and if that’s like other PEGylated medications, it stays active in the body longer than the standard drug. Have you considered vaccination? Are we getting other data regarding effectiveness? Of course, as it’s still in trial, it may not be covered by your insurance. Thanks for the reply. Simon was diagnosed from x ray. No biopsy done. When i was told that vax required a biopsy, we did a needle stick but no cells showed up. Our girl was recently diagnosed with osteosarcoma, and just began carboplatin chemo January 2nd after her amputation two weeks earlier. I did quite a bit of research as we were talking through treatment options, and found some things you might find helpful as well as you think through carboplatin vs. the combination dox and carb treatment. I have never heard of metronomics . Will have to look that up and ask our oncologist. As for the vaccine, it is VERY promising. The preliminary studies show that it is extending mean survival times from 436 (ish) days with amputation and chemo to 933 days when you add the vaccine to the treatment protocol. We have a vet here that is part of the trial and we are just praying that we can hold off met until the end of chemo so our girl can participate. At this point, the only thing I can offer is data, as I have only the early sleepless night experience of a new tripawd guardian. Good luck to you, and I hope you continue to get good news! 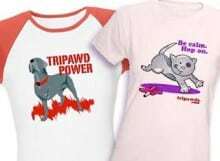 Click any metronomics link for plenty of helpful articles in the Tripawds News blog . Be sure to discuss metronomic therapy in conjunction with any vaccine discussions. Casey was an early participant in the Aratana field trial, but the only prior therapy allowed at that time was Carboplatin. Metronomic therapy would have disqualified him. UF is testing a different vaccine, or at least a different protocol, so they may have different rules.